Daniel Ricciardo took victory at the Belgian Grand Prix after contact on lap two between the two Mercedes cars forced Nico Rosberg to fight back to second and left Lewis Hamilton down and eventually out. Shock: Daniel Ricciardo once again winning a race, especially after Sebastian Vettel looked best placed to win before his mistake coming through Pouhon. Shocker: Nico Rosberg giving team-mate and title rival Lewis Hamilton a puncture on the second lap. The boos on the podium suggests F1 has a new pantomime villain after what could be a pivotal moment in the championship fight. Worst overtake: Rosberg's failed overtake on lap two has to take this. He was not wrong to have a go, but Hamilton stuck to the racing line and once it was clear it wasn't going to work Rosberg had to bail out. He didn't and his team-mate paid the price. Best lap: Kevin Magnussen's defensive driving towards the end of the race was wonderful to watch. Laps 38 to 40 in particular, as he kept Alonso at bay with some ballsy defensive driving. Worst lap: In the context of the championship, lap two was a disaster for Hamilton. If he's going to win the title he's going to have to do it the hard way. Drive of the day: While there was drama going on behind him, Daniel Ricciardo was absolutely faultless out in front. It's clear we are watching a future world champion in the making Red Bull this season. The result extends Rosberg's lead in the championship to 29 but brings a new edge to the title battle after Hamilton failed to finish. The pair made contact at Les Combes on the second lap as Rosberg attempted an unlikely pass on the outside of Hamilton, only to clip the rear of his team-mate as the chicane switched back. The incident punctured Hamilton's left rear tyre, which then unravelled and damaged the floor of his car on the way back to the pits. Rosberg sustained relatively minor damage to his front wing endplate, which was remedied at his first pit stop but in doing so handed the advantage to Ricciardo. The Red Bull driver seized his opportunity and, despite a late fightback from Rosberg, took his second consecutive victory. At the start of the race, Hamilton got the upper hand a better launch from the grid while Rosberg bogged down and dropped to third behind Vettel. The Red Bull managed to get a run on Hamilton through Eau Rouge and was lined up for a pass at Les Combes before running out of track under braking and taking to the run-off. 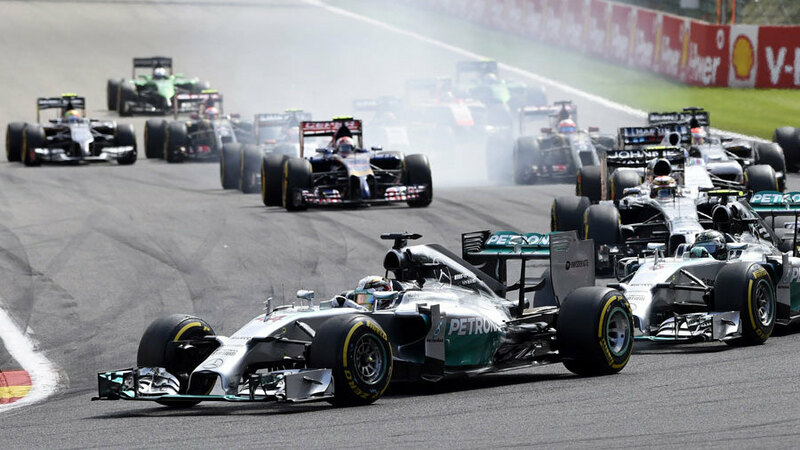 That allowed Hamilton and Rosberg to have a battle of their own, but it lasted less than a lap before sparking the incident that defined the race. A clash between the two was almost inevitable at some point this year, but it was no less dramatic when it finally happened. The ramifications were instantly obvious as the rear of Hamilton's Mercedes twitched and wobbled wide at Malmedy and his left rear deflated. He immediately dropped down the order with the flailing rubber damaging the floor of his car before he made it back to the pits for a new set of tyres. By the time he re-emerged he was 70 seconds behind the leaders with a car that was too damaged to offer any hope of fighting back. Rosberg, meanwhile, was in the lead but coming under pressure with his clipped wing, and had Vettel and Ricciardo - who had passed Alonso on lap four - for company. Ricciardo found a way past Vettel on lap five when the German ran wide at Pouhon, which proved to be a crucial moment for his victory charge as it allowed him to unleash the full potential of his Red Bull. Rosberg pitted on lap eight for a new front wing and fresh tyres, but after the first round of pit stops his life did not become much easier. As he tried to attack Vettel, who had leap-frogged him in the first stops, he locked up at the final chicane and flat-spotted a tyre. That left him vulnerable to Bottas in the Williams who passed him on the Kemmel Straight. Rosberg pitted again on lap 23 to exchange the damaged front tyre, but on resuming this time he got a piece of flailing debris caught on the front of his car. Ricciardo and Bottas were able to wait until laps 27 and 28 respectively to make their pit stops, meaning they could then run until the end of the race on a single set of tyres. Rosberg may have originally planned to do the same, but with his Pirelli's starting to lose grip he opted for one final pit stop on lap 34 to attack with soft tyres at the end. In doing so he dropped behind Raikkonen and Bottas, but with fresh rubber and his Mercedes now running at full-strength he easily found a way back to second. By that stage he was taking over two seconds per lap out of Ricciardo, which on paper appeared to point towards a final lap showdown. However, the Red Bull started to pick up its pace - again proving how accomplished a racing driver Ricciardo is - and held on for victory.